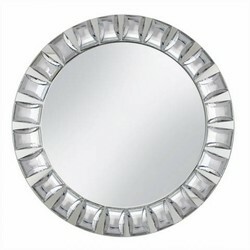 Home > Products > ChargeIt by Jay Large Gem Cut Mirror Charger Plate 13"
Create a stunning and elegant impression with the ChargeIt by Jay Large Gem Cut Mirror Charger Plate 13". Embellished with a decorative jeweled rim and a lustrous silver finish, this product adds a baroque style to any setting. Perfectly sized for multi-course meals, this charger beautifully frames dinnerware while preventing spills and mess that might otherwise stain your tablecloth. Made from premium quality glass, it boasts a delicate look that belies its exceptional strength and durability. This timeless-looking charger plate should be hand washed only.